This Ontario cottage rental is located on Aylen Lake approximately 20 minutes from Barry's Bay for all your needs and only 6 km from Algonquin Provincial park for day trips if desired. The main cottage features and open kitchen, living and eating area with views to the lake and two bedrooms and washroom behind. The guest cottage also has views to the lake with an open kitchen and living area. The lot from the cottages to the lake is grassy and gently sloped and at the water's edge there is a large deck overlooking the lake with a sandy area on shore to the side. There is also a large dock. The water is a shallow sand entry for approximately 40-50 feet out and slopes to approximately 5 feet deep at the end of the 24 foot dock. The water is clean and clear. 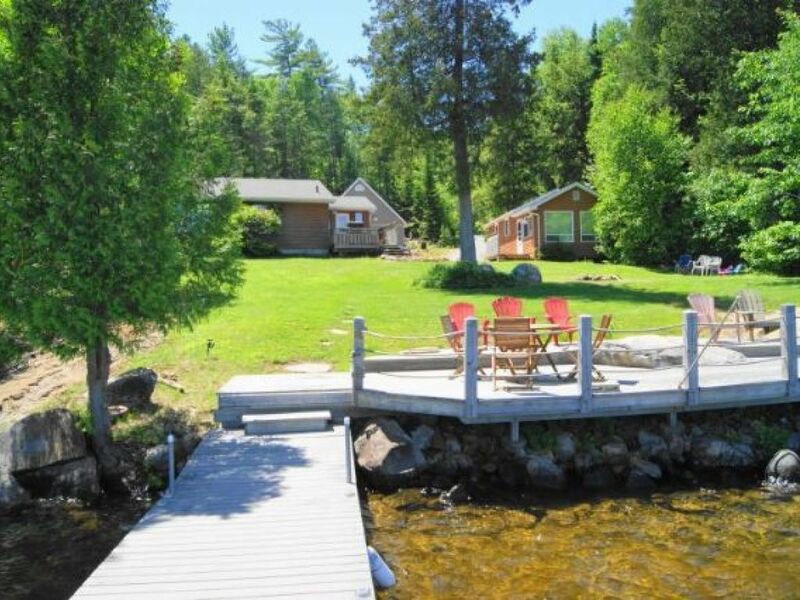 This is a nice spot with fantastic lake views in which to relax and enjoy cottage country! has fridge stove, small microwave, pots pans coffee maker etc. 6 km. to Algonquin Provincial Park- great proximity for day trips! Aylen Lake Marina for boat launching rentals, supplies etc.